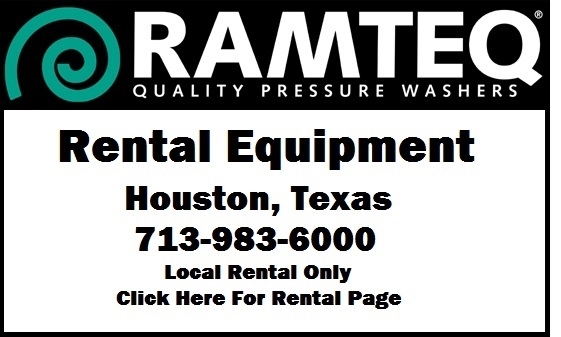 All Ramteq products are designed, assembled and tested in Houston, Texas. 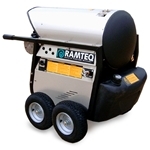 Ramteq offers a wide range of cold water and hot water pressure washer along with a large selection of supplies, parts and accessories for the pressure washing and sewer jetting business. HOT WATER PRESSURE WASHER Ramteq offers a variety of high performance hot water pressure washers, efficient in continuous daily use. Ramteq has designed these products using innovative technology to make the pressure washer very easy to operate, maintain and service if the need arises. These are qualities that make our industrial pressure washers essential for all commercial cleaning applications. Call and speak to one of our industry professionals about whether a Gas, Diesel, or Electric Pressure Washer is best for your needs. 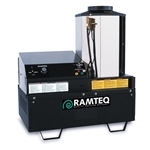 Whether it’s in the cleaning, construction, agriculture, shipping, automotive oil or mining, industry: the Ramteq hot water pressure washers bring high performance to places that otherwise would require much more time and labor for cleaning activities. The original heated cleaning equipment was called a steam cleaner. Back then the water was heated to steam as a way to break down dirt and oil. Over the years experience has shown us that very hot water cleans better than pure steam because it has the power of water pressure combined with heat. The use of hot water instead of steam is also much safer because when water is boiled to steam the pressure can The pressure washers designed and built by Ramteq use several different methods of powering the pump and heating the pressurized water. - GASOLINE POWERED, DIESEL HEATED PRESSURE WASHER Gasoline powered engines are used to compress and pump water for these industrial pressure cleaners. A diesel burner is used to heat the water. Ths pressure cleaning equipment comes in numerous models portable and stationary with a variety of flow rates and pressures up to 4000 PSI. These units are available in both portable and stationary styles. The stationary units can be incorporated into a trailer for contract cleaners and the ability to run without a water hook up. - DIESEL POWERED, DIESEL HEATED PRESSURE WASHER These pressure washers are very similar to the Gasoline powered units. The advantages of diesel engines powering a pressure washer include; longer term life of the product, diesel engines will last longer than gasoline engines if properly maintained; safety, because diesel fuel is not explosive like gasoline fuel is; and there are some facilities and jobs that require that diesel is the only fuel source on the location. 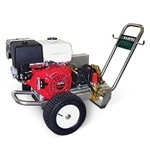 - ELECTRIC POWERED, DIESEL HEATED PRESSURE WASHER These pressure washers use electric motors to power the pump. The burner is diesel fueled for portability. The electric motor is run on a long power cord so that the unit will have portability, or can be used in areas where propane or natural gas area not available. These units can be configured in a variety of pressure and flow combinations. - ELECTRIC POWERED, NATURAL GAS OR PROPANE HEATED PRESSURE WASHER Electric power washers can also be configures to be heated with Propane or Natural Gas burners. These units are usually set up in a stationary configuration but can also be configured for portable propane applications. Like all Ramteq pressure cleaning systems these units can be configures in a variety of pressure and flow combinations.